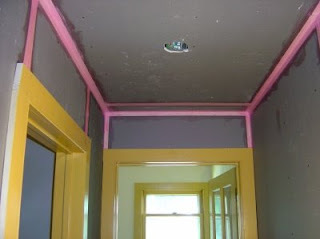 We received the pigment for the plaster in the mail today, and subsequently I started plastering the hallway to the bathrooms. 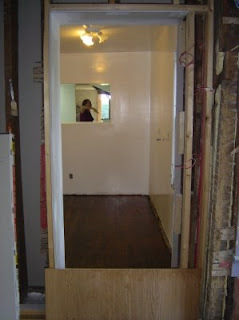 First I taped the drywall seams. I tried something new this time: Instead of using joint compound to adhere the tape to the drywall, I glued them on with plasterweld (the pink stuff in the picture below), which I would have had to use anyway to make the plaster stick to the tape. That seems to work pretty good, and it saves a lot of time. 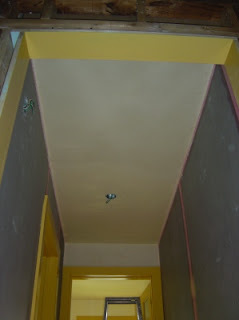 Here is the ceiling all plastered. E! sealed the wait station floor today, hopefully by tomorrow we can walk on it again.